Fans of contemporary dance are in for a real treat with Mourad Merzouki's Pixel performing in Melbourne for a very limited season. Mixing dance and interactive video images projected onto a black scrim screen, it is a poetic blending of two worlds - technology and nature - and how they must find a balance to co-exist in harmony. 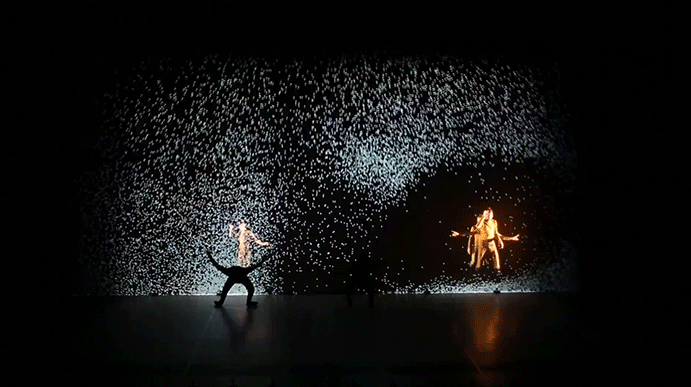 The light projection by Adrien M / Claire B Company is perfectly executed and visually captivating. There are exciting moments occurring throughout, at one point a wall of digital white pixels come crashing down outward towards the audience and crushing the dancers on the stage. There are scenes where the dancers struggle to pass through the haze of pixels and overpowered but then there are also moments of whimsy and nostalgia as the pixels gently fall through to the floor. It is this mutual respect that is being explored throughout Pixel. The performers display a variety of dance skills including hip hop, break-dancing, capoeira, body-contortion, acrobatics and even rollerblading. Merzouki's choreography is complex and varied, but the dancers execute every move with confidence and enthusiasm. Their break-dancing at times is so incredibly fast you almost don't see their feet or hands touch the ground. On its own, this is challenging enough, but ensuring they are keeping in time with the digital projections and working alongside them, adds a whole new layer to the intricacies of the show. Composer, Armand Amar's long history of working with contemporary dance choreographers is evident with this production. His music allows the dancers the freedom to experiment with what their bodies can do, and forges a relationship with the digital projections to be able to tell the same story to the audience. Pixel is a highly entertaining show - both from a technical and an artistic point of view. It is a superb example of how two seemingly very different art mediums can come together organically and result in cast, creatives and audience considering the possibilities that are out there, just waiting to be explored. *Original review appeared on TheatrePress on 2 September 2016.